Our favorite little guy turned one! What a milestone (for him as well as Momma and Daddy)! Of course, we had to have a little party to celebrate the occasion. We kept the party small, just family, but it was so awesome that all the James’ (I, II, III, and IV) were able to get together for the first time! 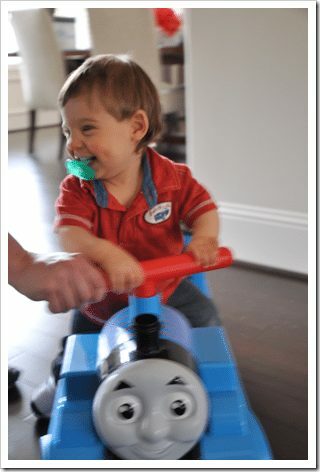 We have so enjoyed this first year- it is pure JOY and LOVE and SWEETNESS with baby James in our lives. A huge thank you to A Blissful Nest for the banner at the top of this post- it made quite the impression as our guests entered the house! She has a wonderful collection of super cute paper goodies so go check her out! 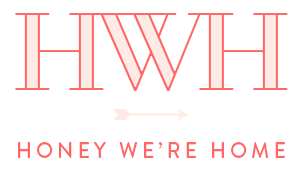 And mucho thanks to Pretty Smitten! About a month before the party, I still had no idea exactly what direction we were going until I saw her adorable train and petals motif. 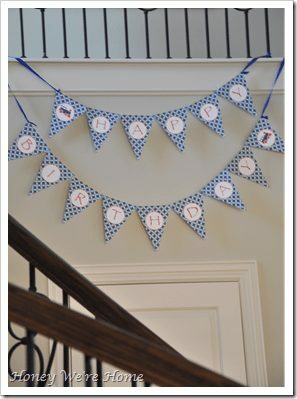 She took it from there, creating the invitations, cupcake toppers, food labels, “James is ONE” sign and the banner at the top of the stairs. She even included personalized thank you notes and stickers. You rock! So, SO, precious!! The party looked beautiful. Good job mama! Tell James Aunty Em loves him! Happy Birthday James! Your mom and dad sure made it a great looking party! What a beautiful party! The food looks sooo good, too. 🙂 Happy birthday to James! Great job on the party Megan! What a wonderful 1st birthday party. What a great party! I liked all of the little details. Happy Birthday! What a wonderful party! 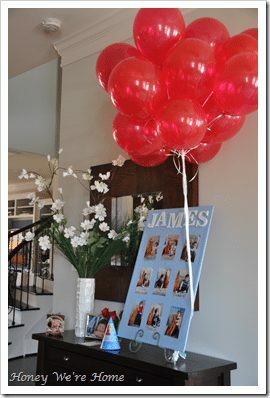 Awww James looked adorable on in his big day!… I'm so glad it went well and decorations and theme are spot on! looks like he had a blast! such a fun party! great job megan! and he has the bluest eyes ever! happy birthday baby james! So glad James had a fun birthday! You did a great job putting everything together. And what an awesome birthday present, I'm sure he's enjoying it! Looks adorable! Goodness he's so cute. 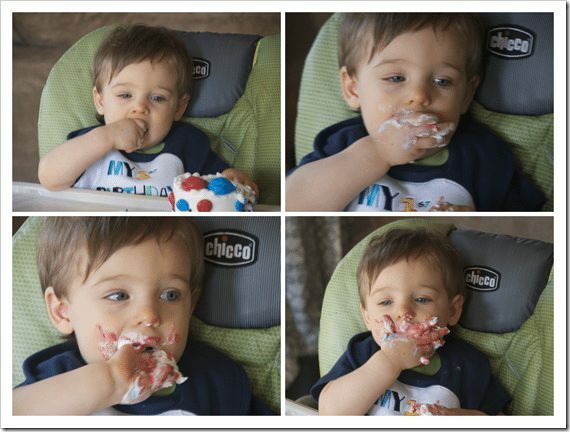 His face in that first picture of him with his cake is priceless!! 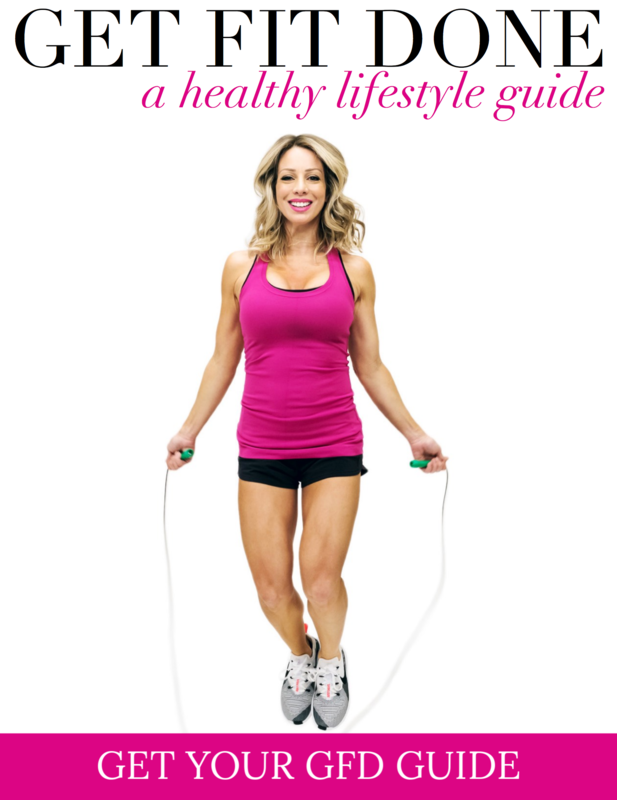 Oh you are SO welcome and it turned out fabulous!! Happy 1st Birthday little guy!!!! He is just too cute and the decor is gorgeous!!! precious, precious, precious!!!! 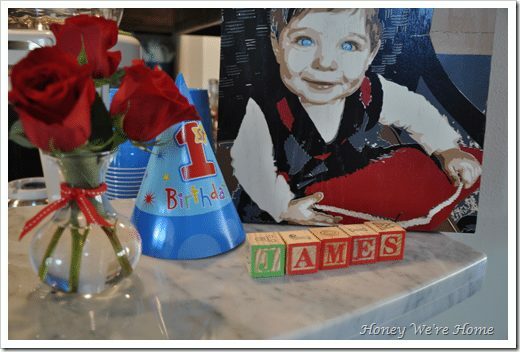 all the decor is adorable, your food presentation is gorgeous…and baby james with the cake is too stinking cute!!! What a fantastic day of celebration! Everything was just perfect. Love the train motif!! The color combos were awesome as well. That first pic with the cake is a riot! Love the last too. Leave it to Courtney to spy the drapes!! LOL (okay, I did too, we're just nosey that way). Wow did he love that cake or what? How fun for all of you, he is such a happy baby. Happy Birthday James! What a cutie! And he's a Thomas fan I see:) And… did I miss something or are you holding out on posting your new curtains! They look fabulous! What a sweet party! 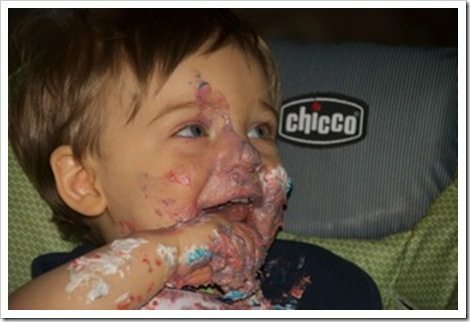 He looks like he really enjoyed that cake! 🙂 Happy Birthday, James! 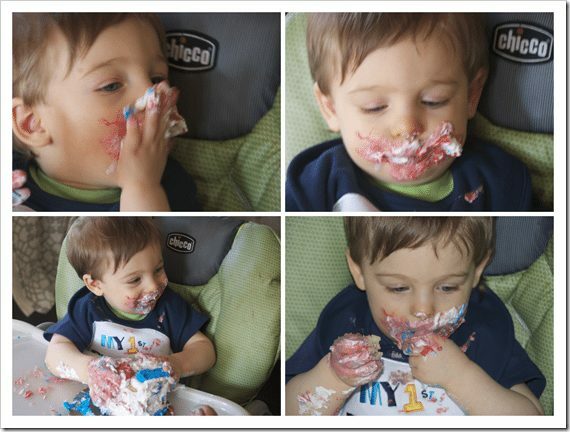 god, smash cake pics are the best. welcome to toddlerhood, mr. james. please don't take any notes from moose or monkey, because they often set bad examples of boys gone wild. and the first is the sweetest. 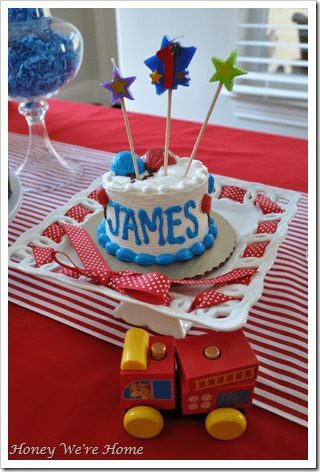 What an adorable party for sweet little James! He looks like he had a wonderful day. Great photos, Megan! Happy Birthday to your little man! 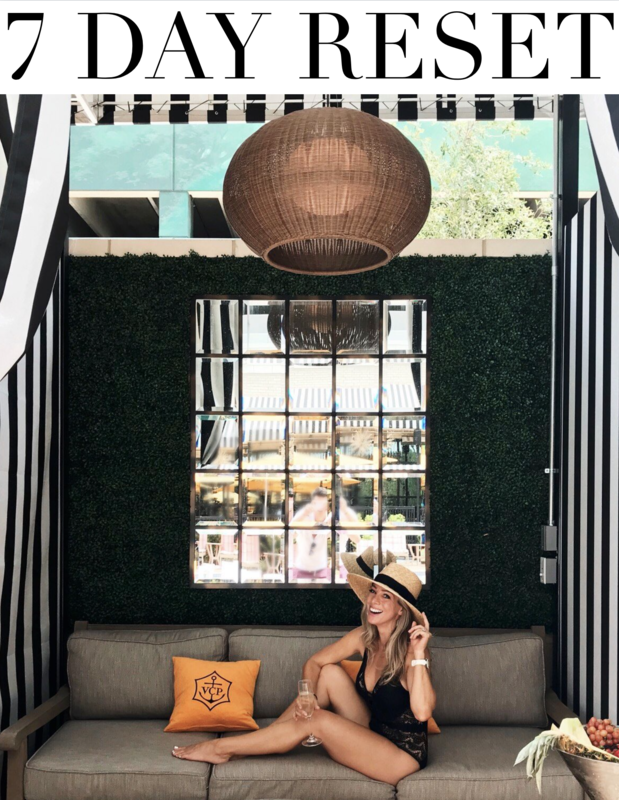 Your decor is amazing!! Everything looks wonderful! Super cute!! it makes me sleepy…my kids get whatever the party store has. haha your a good mom. i wanna know where i can get your fabric for your drapes?!! So adorable! Happy Birthday James! Holy Smokes! That looks like a kind of party Lilly would have had fun at 🙂 Beautiful job, Megan. This is so lovely! 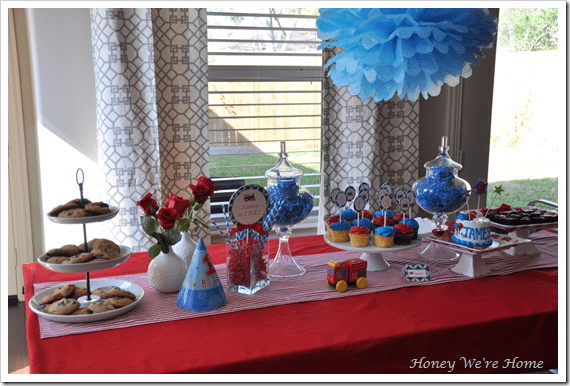 Love all the bunting and the dessert table and the poms – you did such a good job! I love every bit of it! Adorable. Wow!!! 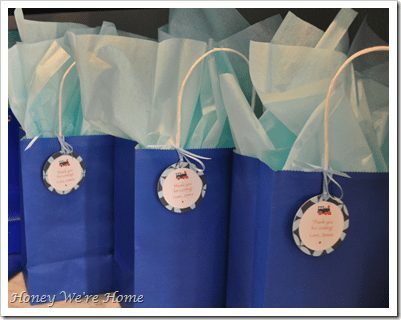 What a great party… you thought of every detail! The little man looks like he loved it! 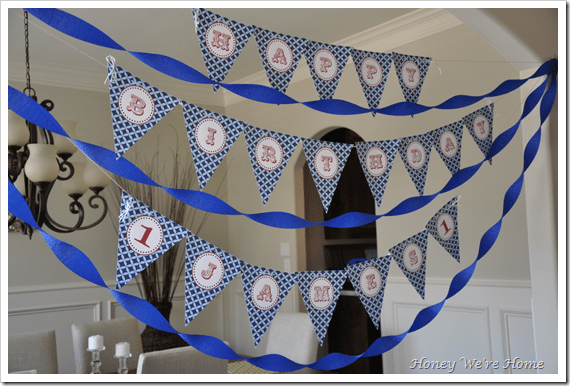 looks like a perfect party for a one year old! He looks super happy on his new toy! Love it! The food looks yummy too! What a special birthday party! 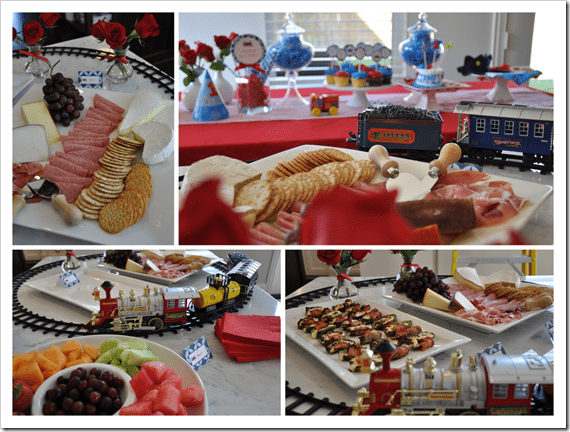 I love the train on the table. So cute! 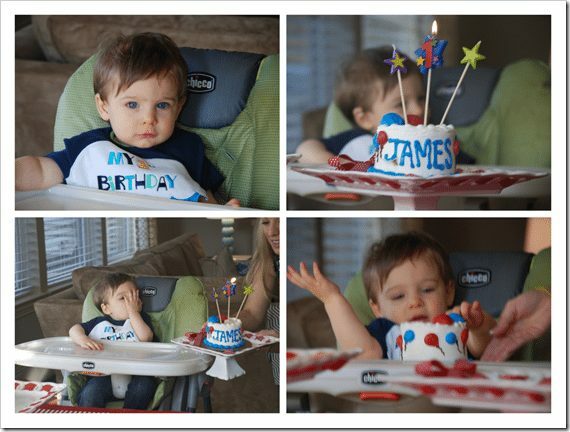 What a great party and james could NOT get cuter! 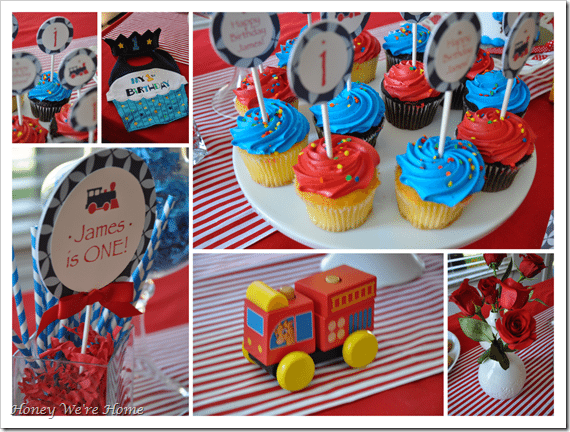 I love a good kid's party and James' party looked fabulous and so much fun! Happy Birthday James & congrats mom & dad. Aww, happy birthday to James and congrats to you and your hubs for surviving one year!! 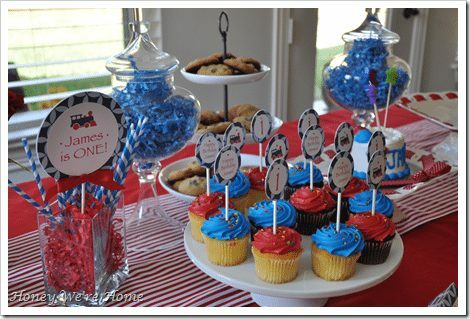 Looks like an amazing party, you did a FAB job on all the food and decor! It looks like a lovely party. Happy Birthday to your adorable son! HAPPY BIRTHDAY JAMES!! GREAT PARTY!! lOVED ALL THE DECORATIONS, FOOD AND THAT LITTLE BOY EATING HIS CAKE! Beautiful! I love all of the creative details. What a joyous time for you all! Those sweet days are so precious! What a festive party you planned! Happy Birthday Baby James! Just precious!! Savor all these moments..they fade so quickly!! Much too quickly!! Happy Birthday to your lil man! Happy Birthday James!! It looks like it was a great party. The food looks yummy too! What a precious party! You did such a fabulous job. And James, he's gotten so big! Happy Birthday to him! 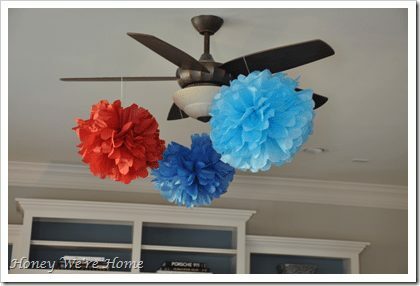 perfect decoration! !happy birthday James! 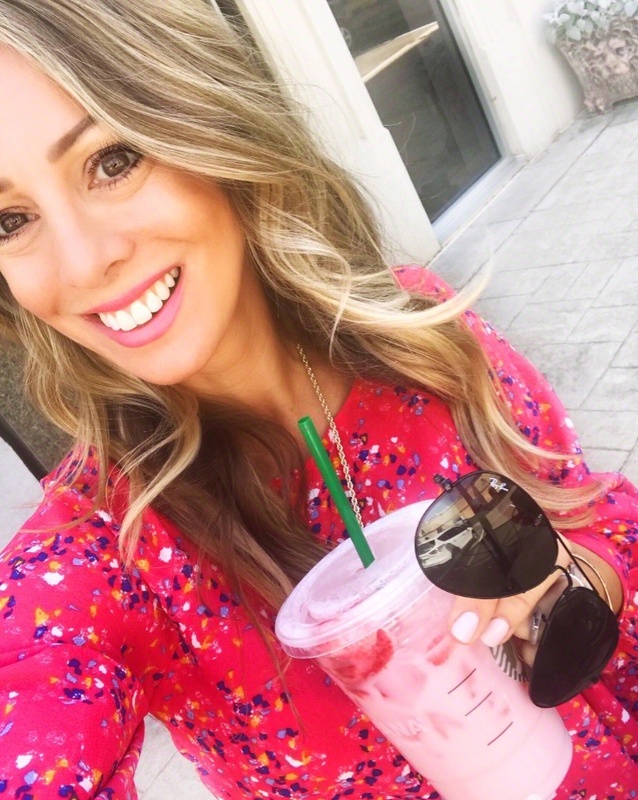 !i love your blog!! Beautiful party, first birthdays ate so special.